For those who are a little more familiar with Japan, you are probably aware of the existence of izakayas. An izakaya (居酒屋) is kind of a mix between a pub and a restaurant, with food and alcohol served in (what is usually) a shop with traditional decor (lanterns and all). As izakayas do not always cater specifically to tourists or foreigners, it can be tough to get your point across in such shops. Here is a look at some of the more commonly used terms in izakayas that may give you a more authentic experience. This is pretty much the quickest way to get beer to the table with no questions asked. nama (生) essentially means draft (when said with beer) and chuu (中) refers to the size of the mug (medium in this case ~500ml). You could try to say it in full too: nama-biiru chuu-jokki (生ビール中ジョッキ). 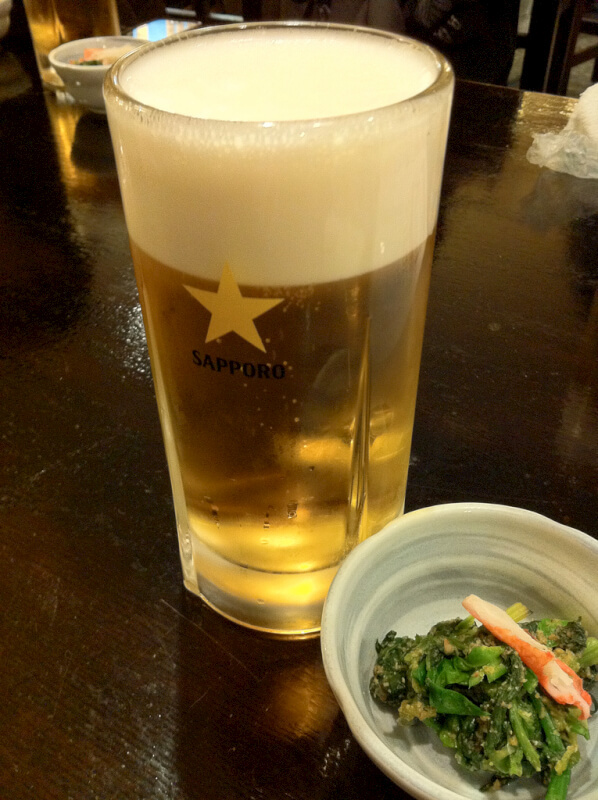 If what you really want is bottled beer (which is usually slightly cheaper), you could ask for bin-biiru (瓶ビール). This phrase will set you apart from the usual tourist/foreigner. It means something along the lines of “(this is fine) for now…”. It is also popular because ambiguity is valued in Japanese speech and it could be an alternative way of saying “that’s all I can afford!” It is usually used with the first-term. So like “toriaezu nama” would mean “Let’s start with beer (and I will decide on the food shortly)”. 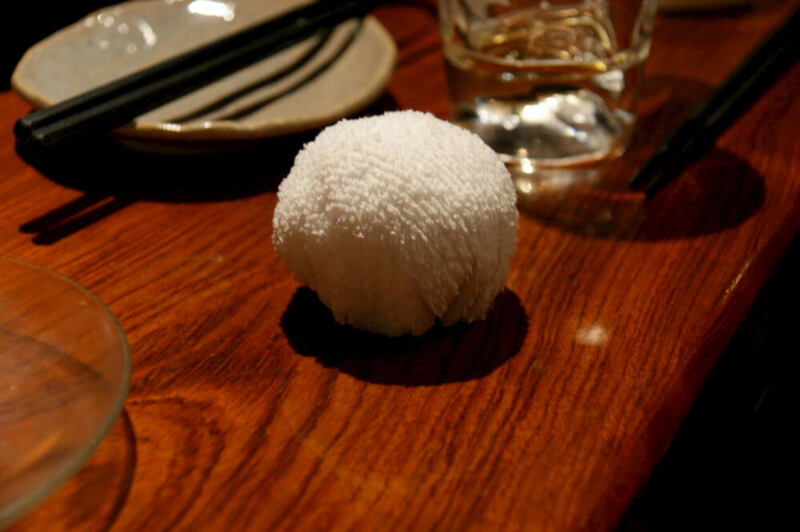 It is a common practice to wipe your hands and even face before eating and to do that, you are usually given a o-shibori (おしぼり). If you are at a ramen joint, however, be sure not to mix this up with a table wipe! Oh and these are usually re-used after proper cleaning and disinfection so don’t bring them home with you! If you get one of these on your bill, don’t get upset. At most izakayas, you will be served an entrée of sorts even before you order. If it is a Chinese-themed joint (which some wouldn’t consider izakayas), probably some peanuts. If its a place that serves seafood, maybe a small helping of fish or squid. These help to tide you over before the main dishes comes, and, of course, are a form of table charge (usually around 300 yen or so). Once you get a waiter’s or waitress’ attention with the obligatory sumimasen or onegaishimasu, you could say chuu-mon to let them know that you are ready to order. Just plainly saying order オーダー works usually too. 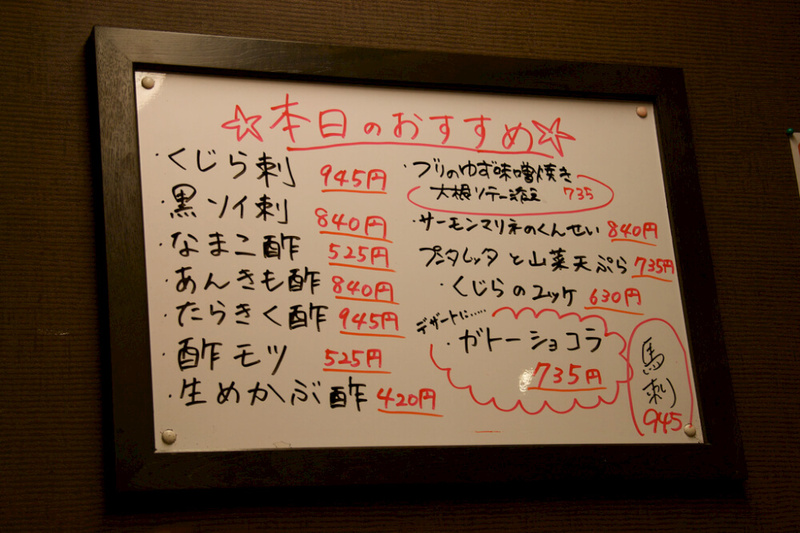 If you are somewhat adventurous and can’t read Japanese menu, you could try asking for recommendations (o-susume). If you are at a small joint with a single chef (also known as the “master”) and he doesn’t seem to busy, you could try your luck even with o-makase (お任せ), which basically means “I’ll leave it to you”. As what it means almost anywhere else in the world. Your time is running short and they are taking the last order. In many izakayas you would almost never ever hear this as they operate through to the wee hours in the morning, where it would be synonymous with saying “Good morning”. So after the last order, you’re somewhat drunk and ready to go home. o-kaikei means “the bill”. String it with an onegai-shimasu to signal your intent to call it a day and pay up. If you want to use something easier but still be understood, you could say check チェック. To sound more sophisticated, you could try or o-kanjou (お勘定) or even o-aiso (おあいそ). Be warned though, the latter tends to be used mainly at sushi joints and can sometimes sound rough. If the waiter points to some direction and mumbles something like reji (レジ), he or she is directing you to pay at a register. Paying at the table is not always possible at izakayas. Oh… and don’t forget your den-pyou (伝票), the bill is usually left at your table and you have to bring it to the reji.